Dear readers, today we will discuss about Line Cook. Line cooks are known as many names like Chef de Partie or Station Chef or Line Chef etc. Many one don’t understand the difference between prep cooks and line cooks. Basically prep cooks are the ones who perform basic starting jobs like arranging and preparing ingredients, cutting items, cleaning kitchen area etc. They are responsible to start the food cooking process and line cooks finish the process. From our today’s mega tutorial, you will learn everything you should know about Line Cook. Lets start. 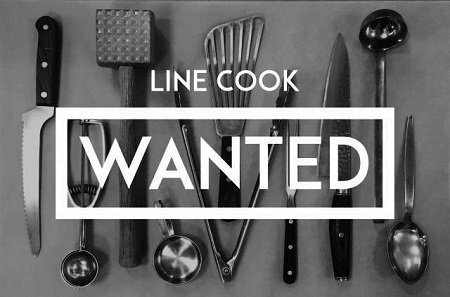 Position Title: Line Chef or sometimes referred to as Commis II or Chef de Partie. Don’t Miss our Premium training manuals. click HERE TO GET THE DISCOUNT. HURRY UP GUYS..
Line Cook Definition A line cook reports directly to the sous chef or the head chef if the restaurant doesn’t have a sous chef. Being a line cook, you would be expected to perform your tasks at a high volume environment kitchen. The line cook is expected to be able to create a remarkable culinary experience for the restaurant guests by preparing, cooking and presenting top quality food. The line cook is also responsible for taking up a leadership role when the executive chef and the sous chef are not present. A line cook must observe all hygienically protocols and necessities and also be responsible for the right handling and preparation of all food items and equipment. In his or her position as a line cook, will also help the Sous Chef to strategize and formulate top quality service for the food and beverage making division. It is his or her responsibility to provide to the restaurant guests the top level and efficient hospitality service. A line cook is required to work in his or her designated station as assigned by the sous chef or the executive chef. Be quick in putting away orders and ensure that the designated station runs seamlessly. Be able to work within the set time frame when preparing food to meet the guest expectations. Have the knowledge to run and operate kitchen machines like braising pan, baking ovens, stoves, grills, microwaves, and fryers. Be able to punctually produce high-quality products for the guests and or staff. Responsible for maintaining cleanliness, sanitation at his or her assigned workstation. The line cook is responsible for all food preparations using the right recipe. Be able to prepare all the items on the menu. Make, give flavors, and cook a wide array of meats, vegetables, soups, breakfast dishes, and other food items. Wash and peel fresh fruits, vegetables and also be able to weigh, measure and mix ingredients on correct proportions. Have general knowledge of cooking temperatures, making soups & sauces, preparing entrees, vegetable preparation, and a la carte cooking. Check supplies and prep lists and ensures all items are prepped in a timely fashion. Refill service lines as required and replenish and prepare the kitchen station for the next shift. Ensure products are stored safely in the right location at the appropriate quantities at all times. Ask for any assistance when needed during demanding periods and report any cases to the Sous Chef to guarantee the best service to guests. Check and confirm the accuracy of the temperature of the kitchen appliances and food. Wash and disinfect kitchen area, workstations, tables, tools, knives, and other equipment. Uphold correct portion size and quality of the food to the hotel’s standards. Minimize food wastage and uphold controls to achieve forecasted food cost. Review work and follow-up activities that are required with executive Cook before leaving. Assist the sous chef in providing on the job training & development of new cooks. Assist other Team Members in the kitchen when needed or perform any other tasks assigned by the hotel management. Ensure all the kitchen appliances like ovens, deep fryers, and the stove burners are turned off. Taking dirty dishes to dish washing room. Ensuring that the grill is cleaned. Wiping the oven, in and around. Making sure that area around fryers is tidy. Check that the deep fryers do not contaminate food by constantly refilling grease in them, clean and rotate them. Dispose of all the leftovers in their designated disposal area. Fill-up refrigerators and all the empty and half empty drawers. Ensure seasoning containers are cleaned and refilled. Clean all the counters and shelves in the station. Perform general cleaning of the kitchen. A good line chef should possess efficiency and speed qualities. Working quickly and efficiently is one of the strongest selling points of a good line cook. He or she must ensure that the objectives of the station as far as speed and service provided are met properly as well as maintaining the high-quality food standards. Organizational skills: A line chef is expected to ensure that the kitchen station is in good, organized state. Keeping a required level of all products in the right areas of storage is a sign of a good line cook. It is his or her responsibilities to ensure that the right tools and appliances are ready anytime they are needed. Ability to keep level-head in fast-paced work conditions: This includes being able to think quickly while various activities are still going on simultaneously. Have pride in his or work and focus in providing quality services to all guests: as this will play a major part in influencing the guest’s overall experience of their visit. One way of ensuring customers are satisfied is for a line cook to take pride in serving great food that follows the defined and standards set by the kitchen station. Being a team player all the time: Being able to be aware of all situations that are going on at the same time and be ready to jump in and help whenever the need arises. Outstanding understanding of numerous cooking methods, ingredients, equipment, and procedures. Able to work in a fast-paced environment with speed and quality. Great personal hygiene and grooming standards. Should possess excellent communication skills, both in reading and writing clearly and effectively. Have a previous excellent working record as a Line Cook. Obtain a Culinary school diploma from a recognized institution. Possess deep knowledge of different methods of cooking, using arrays of ingredients, equipment, and techniques. Precision and quickness in implementing allocated errands. A high school education or diploma in culinary from a decent institution is essential accompanied by basic computer skills and being conversant with different inventory systems. A good amount of experience under your belt would go a long way to help you land a job as a line cook at any level of restaurant. Line cooks work in restaurants and cafeterias. They are responsible for making and cooking numerous appetizers, entrees, and desserts. Before they get to preparing and cooking, line chefs are required to ensure that the ingredients are in the right state of freshness, the workstation is clean, and the required appliances are readily available. Line cooks follow recipes, blend ingredients and prepare different types of foods using a number of cooking methods like braising, steaming, baking and broiling. You will be required to spend a huge amount of hours standing not forgetting the amount of stress that is involved with the need to work fast, yet competently. Post-secondary education is not mandatory to get a job as a line cook, a high school diploma is usually preferred by many restaurants, cafeterias, and well-established food service companies. Taking a mathematically based course would help a prospective line cook with essential tasks such as ingredients measuring and calculating portions. Consider getting a part-time job while still in high school, this will help you to gain the valuable experience needed for landing a job as a line cook. Complete a culinary apprenticeship to put yourself on a solid ground of launching a career in the food industry. The apprenticeship pools together academic coursework and on-the-job training. Apprentices can also receive remuneration for their work and gain valuable experience in the culinary field. There will be all kinds of opportunities present to work in any food service institutions including fine dining, catering and short order. Complete on-the-job training. This is normally part of the orientation process at all sorts of restaurants and cafeterias. It’s vital for newly hired line chefs to learn what kind of food items that are on the menu and different ways of preparing certain meals. Each food service business has its own defined policies and regulations concerning garnishes, food preparation, IT systems, and processes of ordering food and food supplies. For line cooks expecting to take their careers to a new level, quality experience and further training will be indispensable. Experienced line cooks possess the ability to move into careers as sous chefs and head chefs. Obtaining certification. Line cooks may be qualified for the Certified Culinary awarded by the American Culinary Federation. Requirements to be considered eligible include high school diploma plus two years of valuable experience. The organization has its own examinations that you will be required to pass. Complete on-the-job-training to gain much experience as possible. To this end, it is prudent to put emphasis on the two outstanding qualities of a line cook. Firstly, one must be in position to withstand pressure and be capable standing for long hours. Every day is full of tasks in any standard restaurant. That is why you should be able to hassle and increase the speed with which you approach tasks to keep pace with demands from clients. Remember, customers will always be demanding, especially for your services. As a line cook you should always be calm and discharge duties as fast as you can. Always be of sound mind and avoid disputes with clients. What is more, be patient and love your work. A line cook position demands that you do nearly everything in the kitchen. Patience will be key to your success. Without love for your work, you will always get bored by everything, an ingredient for failure. From the job description, a line cook is required to do many things. With love for your work, it will be quite easy to remember each and every bit of what is required of you. Never ever will you get tired in pursuing your career until you fulfill your dreams! In light of the above, it is an indisputable fact that a line cook is an integral member of a kitchen. He or she does most of the things, something that requires exceptional qualities such as patience and love for work. With exclusive devotion to your work, you will always succeed.